Lakewood Plaza, outdoor living space, Long Beach, California, 1950s. Maynard L. Parker, photographer. 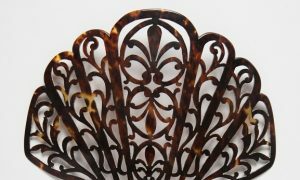 Courtesy of The Huntington Library, San Marino, California. With summer so close you can almost smell the mesquite smoke wafting from your neighbor’s grill, many Americans are setting their minds to clearing out long-neglected garden plots, polishing up the patio, and spending quality time with family and friends in the backyard. That suburban outdoor living space is more of a recent phenomenon than one might think. 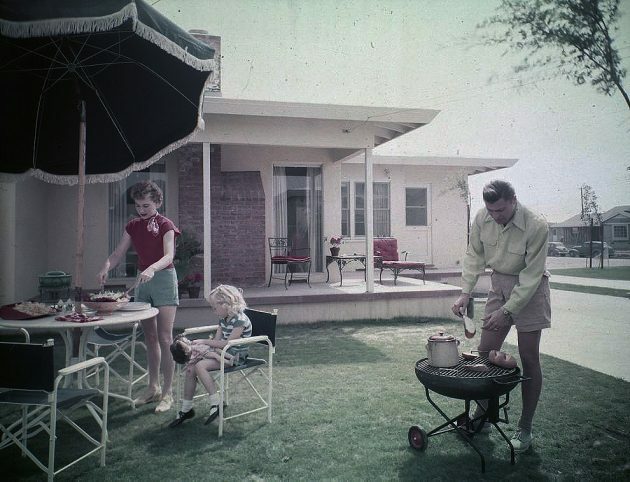 Before you hit the summer barbecue circuit, here are five facts about the American backyard to ponder with your patio pals, courtesy of Kate Fox and Cindy Brown, curators of “Patios, Pools, and the Invention of the American Backyard,” from the Smithsonian Institution Traveling Exhibition Service. 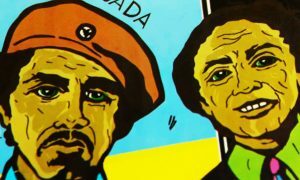 The exhibition sheds new light on how some Americans came to claim the backyard as their private domain. After World War II, people began moving out of congested cities and into newly built suburban developments that included private backyard spaces. The adoption of the 40-hour workweek, a shift from blue-collar jobs to white-collar jobs and an increase in disposable income meant people had both time and money to embark on some do-it-yourself (DIY) projects. The result: Uniform backyards were transformed into personalized havens devoted, in part, to rest and recreation. 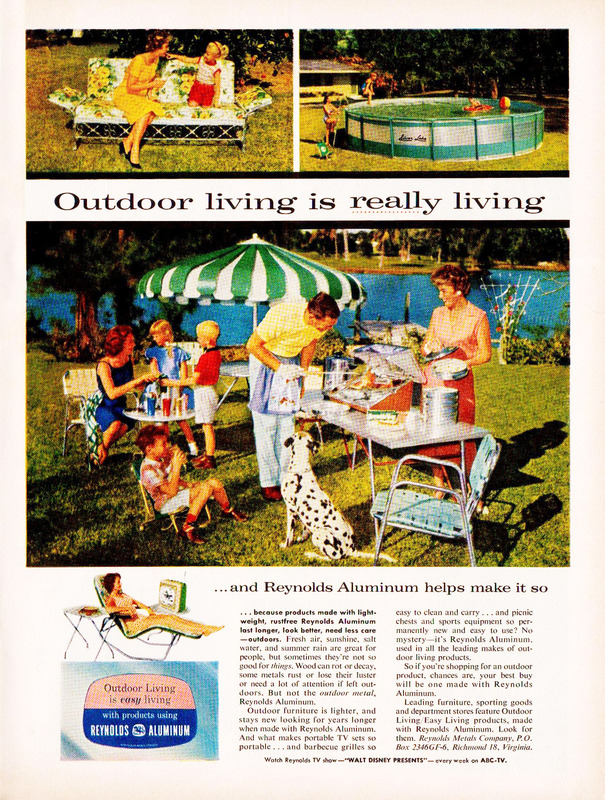 “Outdoor Living Is Really Living,” Reynolds Aluminum advertisement. Warshaw Collection of Business Americana, Archives Center, National Museum of American History, Smithsonian Institution. During World War II, restrictions on chlorine and concrete once meant private in-ground pools were only accessible to the ultra-rich. Afterwards, in-ground pools became affordable thanks to the sudden surplus and availability of these materials. The Farnham family in their Mendham, New Jersey, garden, 1960s. Molly Adams, photographer. Smithsonian Institution, Archives of American Gardens, Maida Babson Adams American Garden Collection. Advertising and popular culture began depicting modern outdoor living spaces filled with turf, patios, grills and even swimming pools. 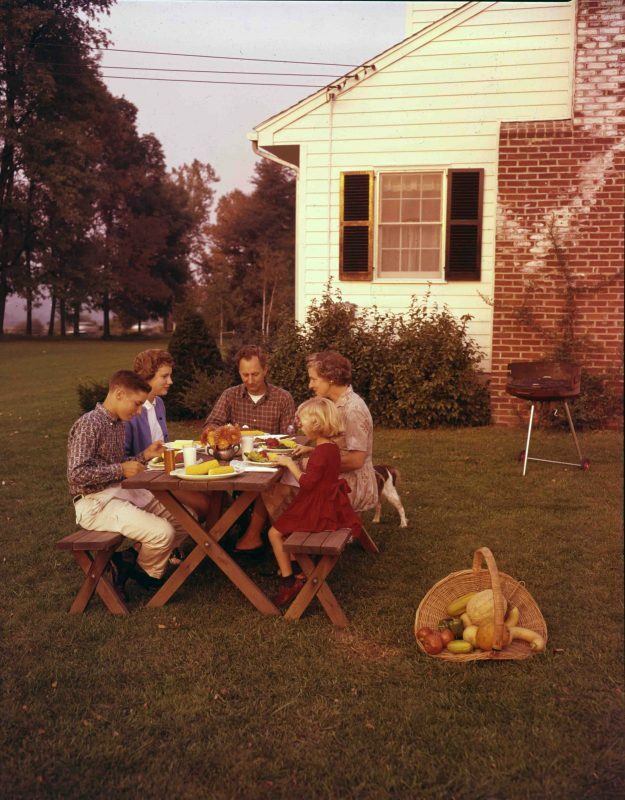 Lifestyle magazines touted an idealized suburban world that revolved around outdoor entertaining. Pepsi introduced its Patio Cola, a precursor to Diet Pepsi. Suburban tract housing and large-scale developments began popping up in the open spaces outside cities, characterized by a change in the style of houses being built. 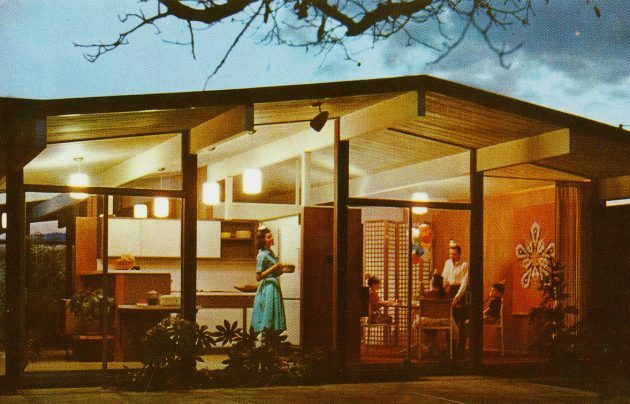 Modern ranch houses were going up quickly and inexpensively everywhere. Front porches and stoops were stripped from the designs, fundamentally changing the focus of community interaction. Socializing migrated from the front of the house around to the backyard. 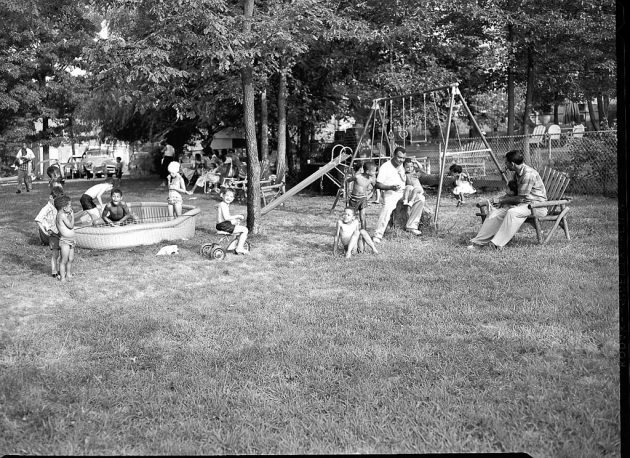 Add the ubiquitous fence and more private, invitation-only socializing became the popular norm. In 1957, an episode of “I Love Lucy” played on the comedy of building a backyard barbeque grill. People could relate to the humorous mishaps of a new DIYoutdoor project. 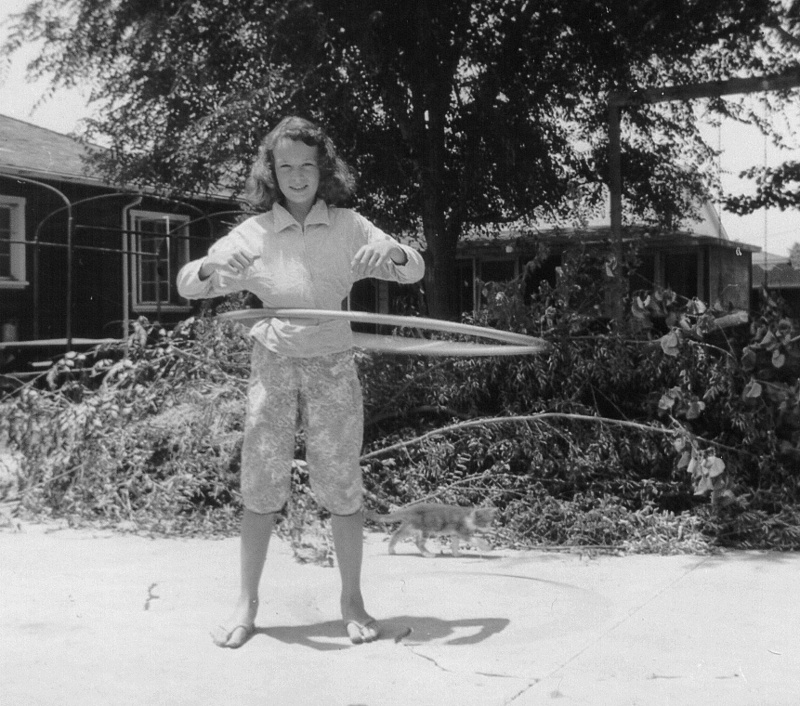 Roxanne Mather, 11, with a hula-hoop in her backyard in Santa Ana, California, December 1958. Edgar L. Kanouse, photographer. Courtesy of a private collection. Where yards had once been a utilitarian space, with kitchen gardens and sometimes even farm animals, the new backyard became a status symbol of American life. A pristine lawn and patio showed that you had both free time and extra money to make the open space behind your house a private oasis. Share your backyard garden through Smithsonian’s Community of Gardens, a digital archive for sharing and preserving the stories of gardens and the gardeners who help them grow.